Located at the intersection of two busy streets in the West Lake area, Xuan Dieu and Quang An, is a hidden nightlife treasure, known for its unique music and atmosphere. You can have a fulfilling evening starting with dinner in any of the nearby restaurants and then head over to enjoy your night at 112 Xuan Dieu – Savage. Just walk a few steps from the street and you will enter a different world of its own: the bar area with impressive lightings, and the lounge area that provides enough space for large groups of friends as well as a private cozy atmosphere for couples. Right next to the bar is the entrance to Savage Club, the more well-known sibling of Savage Lounge, both in the same premise. 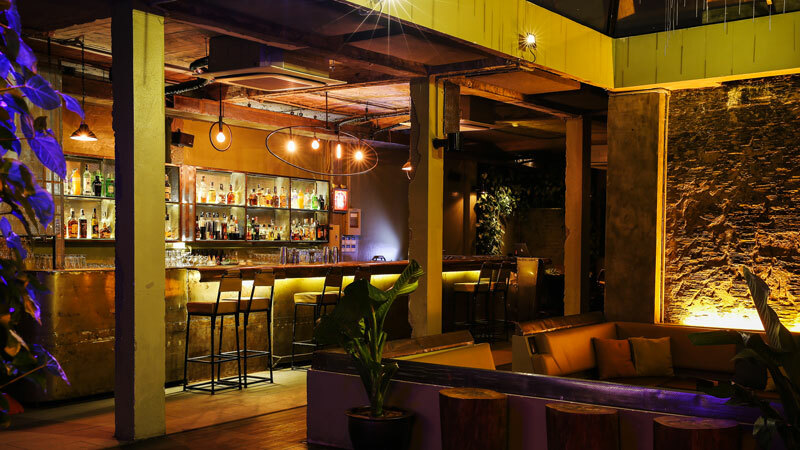 Despite its name, Savage is one of the most elegantly designed nightlife venues in Hanoi. Sure, the decor has a 20th century retro feel to it: the underground establishment has metal furniture to remind you of Hanoi’s wartime years. But the pictures on the walls and the center lounge area with a glass roof looking out to the night sky tell you that the owners have an appreciation for the arts – something that is rare to find in crowded corners, but also characteristic of Hanoi. Seriously good, funky music, from techno to disco to house, sets Savage apart from the crowd of electronic dance music bars and clubs around Hanoi. 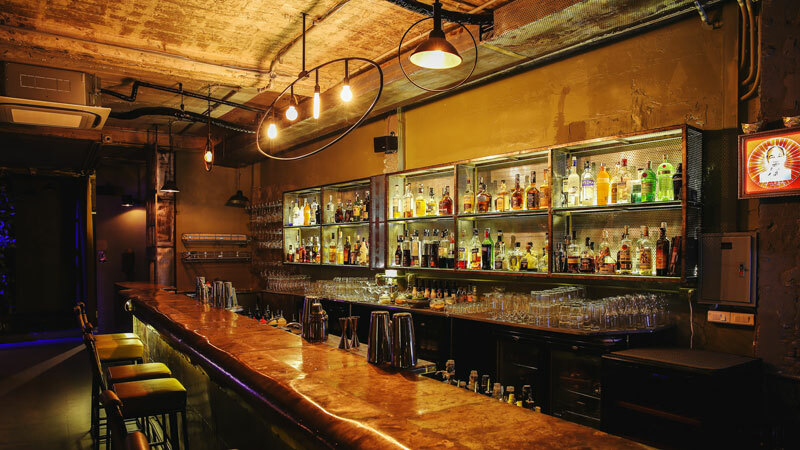 The relaxed and sophisticated ambience makes it the perfect hideaway for night owls that have a taste for drinks. Savage Lounge offers a cracking list of signature cocktails, mixed together with classic cocktails and mocktails. The best selling cocktail is the Hot Feeling – a true tropical drink that infuses freshly squeezed lime with vodka, and finished with red Thai chili juice. Jungle Nectar is another recommendation from the staff. But what makes people come back here is the top-notch, professional service. The well-trained and friendly bartenders know what you want and never rush when making drinks, no matter how busy the bar is. The quality of service here is definitely worth the visit. There are monthly promotions and events for champagne lovers and cocktail aficionados: check out Thursday Bubble once every month (2 for 1 Champagne Bollinger bottles, Grey Goose bottles and cocktails); Girl Gang (a proper girls’ night out with old-school music and discounts for ladies all night); and Nap (live ambient music night featuring talented local artists). Savage Lounge has a capacity of around 150 people, and opens at 6 p.m. from Tuesday to Sunday. The Lounge is also used for exhibitions and photoshoots. The team is led by Fabien Marcault, who loves his bar and drinks. We are excited to hear that they plan to open the rooftop of the Lounge for a new restaurant around April or May, with an 80-seat capacity. The fully covered rooftop restaurant will feature an amazing view over Tu Lien Lake and the pagoda of the same name. With the restaurant opening at 3 p.m. every day, Savage Lounge will be able to showcase different moods – restaurant by day and bar by night. Of course, it’ll always be a little savage. Little needs to be said about Savage Club, which opens on Friday and Saturday nights and attracts a crowd of some 400 people per night, both local and expats. 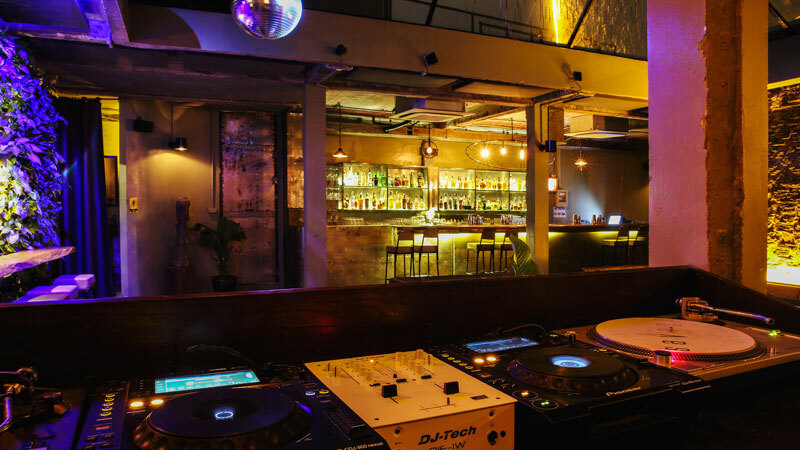 Founded and managed by Ouissam, the well-known DJ and founder of Cliché Records Hong Kong, Savage Club is proud to have hosted the London-based band Boiler Room for the first time in Southeast Asia. The narrow entrance from Savage Lounge leads to a secluded space with darker lighting, creating a more mysterious and thrilling atmosphere. The Funktion-One sound system provides a crystal clear sound experience, and a lineup of selected international DJs brings you fresh music every weekend.